A young man who lost his life following a road crash was a father who harboured a “great passion” for motoring and mechanics. Scott McNeill, 21, died as a consequence of a crash on the Ballynahinch Road in the Carryduff area of Co Down on Wednesday night. The police had said at the time that two cars were involved. Mr McNeill – from the Dromara area – was taken to the Royal Victoria Hospital where he was in a critical condition on Wednesday night. By mid-afternoon on Thursday, the PSNI had announced he had died. Another patient has since been discharged. 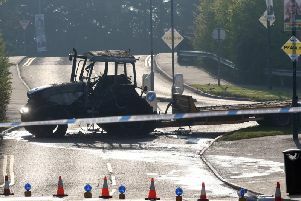 It is believed Mr McNeill had been the driver of one of the vehicles at the time of the accident. His family were too distraught to speak on Thursday. Rev David Hyndman, minister of Magherahamlet Presbyterian Church, to the south of Ballynahinch, said he had grown up in the church since boyhood, and had also been a member of the Boys’ Brigade. “He was very practically-minded, Scott,” said the minister. He trained as a mechanic and had worked at breakdown firm Watson Recovery. Aged 16, he had also been a champion autograss racer – autograss being a motorsport where competitors race on soil surfaces. “He was just a typical young man,” said Rev Hyndman. “Really full of enthusiasm and excitement for life, but with a very caring heart. “[News of the accident] was a shock, very much so. It was totally unexpected. “They worked very hard up at the Royal to try and save his life but his injuries were just too extensive. Mr McNeill had a son, Samuel, plus a brother and a sister. Police are continuing to appeal for anyone who was travelling on the Ballynahinch Road and who witnessed the collision to contact officers in Lisburn Police Station or the Collision Investigation Unit in Sprucefield on 101.